Oral surgery is necessary under certain conditions. Oral surgery is needed for severely decayed teeth. Oral surgery is a smart option for periodontal disease. You may need oral surgery if you have broken teeth that can’t be repaired. Do you have poorly positioned teeth in your mouth? Oral surgery replaces impacted wisdom teeth. We understand extracting a tooth can lead to dental health problems. Dr. Yeh will discuss your mouth surgery options. Sea-Tac Family Dentistry has options available instead of tooth extractions. We can do a tooth replacement instead of a tooth extraction. Other options include dental implants, bridges, partial dentures or complete dentures. For oral surgery we can use sedation dentistry and nitrous oxide. Schedule your free dental consultation. Learn more about oral surgery today. Visit the oral surgeons of Seattle today. Dr. Yeh and his highly trained staff will complete your oral surgery procedures. Tooth extractions must be done correctly for good dental health. The oral surgeons of Seattle provide safe and beneficial oral surgery. Dr. Yeh is a highly qualified oral surgery dentist. He will remove badly damaged teeth. The oral surgeons of Seattle are dentists who will help you fight severe gum disease. You’ll get sound dental advice on your options for oral surgery. From tooth removal to oral surgery after care, the oral surgeons of Seattle will maintain your dental health. Removing wisdom teeth is one of our dental specialties. During your oral surgery extraction Dr. Yeh will number your tooth, jaw and gums with a local anesthetic. You’ll feel great pressure during the oral surgery extraction process. The pressure is created from rocking the tooth to widen the socket for tooth removal. You’ll feel the pressure without pain, because the local anesthetic has numbed the surrounding nerves. Any nerves transmitting pain aren’t widely affected. If you feel pain during your oral surgery extraction process, we’ll do what we can to make you more comfortable. After oral surgery you’ll need quality home care. 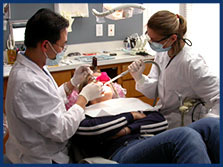 The oral surgery after-extraction home care program will help you to maintain good dental health. Oral surgery after-extraction home care helps stop bleeding and blood clots that form in the empty tooth socket. Use oral surgery after-extraction home care to stop swelling. It will help you with brushing and cleaning your teeth. Our oral surgery after-extraction home care offers helpful advice on over-the-counter pain medications to take. You’ll also learn how to eat and the healing process of oral surgery. Read below for instructions. Bleeding: Put a wet gauze over your empty tooth socket. Bite down for 45 minutes to stop the bleeding. Blood Clots in Empty Socket: Don’t dislodge the clot. Avoid rinsing or spitting for 24 hours after the tooth extraction. Avoid using straws, smoking or drinking hot liquids. Swelling: If swelling happens, place ice on your face for 10 minutes on and 20 minutes off. Repeat the cycle if necessary for up to 24 hours. Pain Medications: Use non-prescription pain relief medications if you’re feeling pain. Helpful pain medications are acetaminophen or ibuprofen. Eating: Chew away from the extraction site. Don’t drink hot liquids or alcohol for 24 hours. We recommend a liquid diet for 24 hours. Brushing and Cleaning: Avoid brushing and cleaning the teeth near your extraction side for 24 hours. Avoid commercial mouth rinses. They irritate the extraction site. Rinse with salt water after 24 hours. Use a ½ teaspoon in a cup of water. Do this after meals and before sleeping at night. Dry Socket: Follow our oral surgery after-extraction home care instructions. This will help you avoid dry socket. Dry socket happens when a blood clot fails to form in the socket after a tooth extraction. Signs of dry socket are dull throbbing pain, 3-4 days after the tooth extraction. Pain is moderate to severe and radiates from the tooth extraction site. Other signs include bad taste or bad breath. Dr. Yeh will apply a medicated dressing to soothe the pain in the dry socket. Healing: Your tooth socket will have a hole in the jawbone. This space will smooth and fill in with bone. The healing process can take 6+ weeks or months to finish. Within 1-2 weeks you shouldn’t have any problems. Contact us if you do.